Without hesitation I can say that I’m happier now than I can ever remember being. 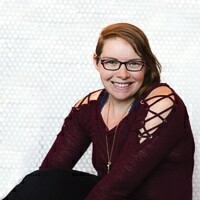 I turned 26 last month and I’ve found myself reflecting on the little truths I’ve learned about happiness in my first 25 years. I wasn’t always a happy person; I spent many of my younger years expecting that happiness was unattainable. Fortunately, things change. I used to think happiness is some out-of-reach place where everything suddenly turns to sunshine, rainbows, and unicorns with no hints of anything negative. Happy people (me included!) still experience sadness, frustration, annoyance, and ennui. And I still experience them on a near daily basis. And those emotions aren’t bad – we experience them for a reason. Sadness can even be cathartic! But I do my best to avoid falling into a black hole of those emotions. I know that life has its highs and lows, and a few sad days don’t have to overtake your entire life. I’ve learned to actively look for sunshine or unicorns (usually in the form of my cat companions) in everyday life to pull myself away from prolonged anger, anxiety, or depression. It’s not always easy, but I’m a happier person in general for my efforts. Nope, it doesn’t work like that. At my worst, I would talk to myself this way. But happiness doesn’t just happen once we reach some milestone. Waiting for those grandiose, long-term goals distracted me from all the struggles I was having internally. Deep down, I knew that I had an extremely poor self-image, but I depended on something external to validate my worth. I know. I know. This sounds corny and cliche and you’re about to click away. Don’t. As hippie-esque as it seems, this one’s totally true. I didn’t start to feel happy, truly happy, until I took a hard look at myself and started to focus on what I could do to (first) like myself more and (second) realistically create the sort of life I wanted. But here’s the thing. No amount of outside advice could suddenly turn my life around. No amount of waiting for something to happen (see above) would spring me into that magical, sunny beach I thought happiness was. It started with me. I had to decide to change things in my life to make myself happier. I don’t think people can truly make a change unless they’re committed to it, and happiness isn’t any different. As mentioned above, not every moment is filled with bliss. And that’s okay…but sometimes, I simply choose to smile. Usually, these are little moments. Someone cuts me off while I’m driving to work, I spill my morning coffee, I didn’t get the PR I was expecting in the gym, dinner didn’t get made until an hour before bed. These little things used to put a thorn in the rest of my day. One event could ruin my entire day. But why—is my entire day really doomed because something didn’t go my way? Practicing gratitude and actively seeking out the positive make it much easier to accept things with a smile. My Man Spouse is very helpful in this regard; when I start worrying about money, he reminds me that we narrowly avoided $30,000 in medical bills or that we have everything we truly need, and that’s enough. Many of those little moments that used to pester me are now easy to shrug off. It’s not always easy to let go of negativity, but it gets easier with practice—and I’m definitely happier as a result. And there you have it. 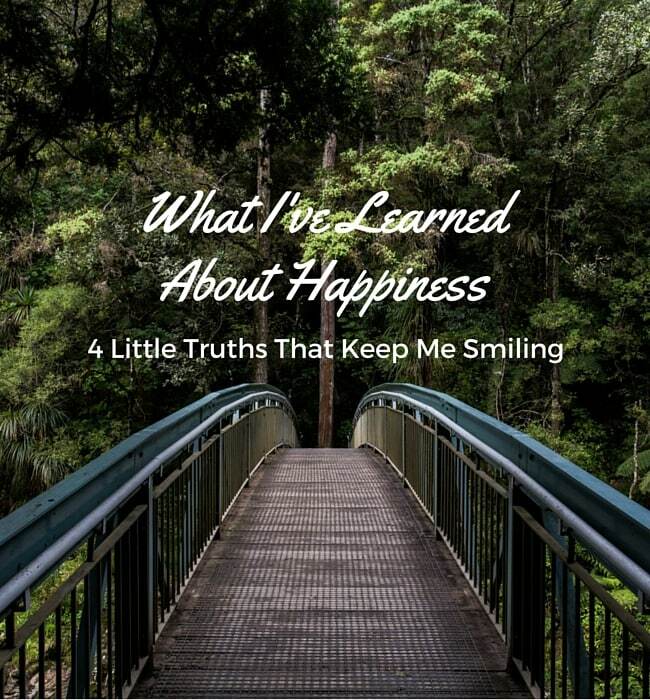 What I’ve learned about happiness in my first 25 years on this planet, boiled down into 4 simple truths. These are the things that keep me smiling…but I want to hear from you, too. 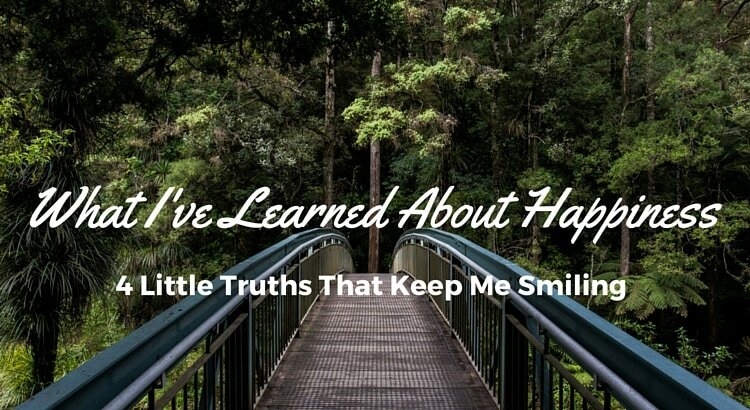 What are your bits of wisdom about happiness? Are they similar to mine, or do I still have a lot to learn? Don't subscribe All Replies to my comments Notify me of followup comments via e-mail. 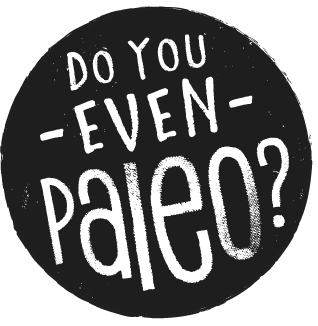 You can also <a href='https://www.doyouevenpaleo.net/comment-subscriptions/?srp=1540&srk=87505361eee98908ddf6ccb8681f50d6&sra=s&srsrc=f'>subscribe</a> without commenting.